Erin Kamano and Dirk von Guenthner attack heavy bags at the Icon Sport MMA and fitness facility in the Niu Valley Center. With participants and fans increasing in number by the day, mixed martial arts has been called the fastest-growing sport in America -- even the world. But not everyone is ready to step into the ring for full contact in this hybrid sport that incorporates various fighting disciplines -- from boxing and kickboxing to jujitsu and wrestling. Some fear getting knocked in the noggin or having neck and limbs locked with an array of submissions; others are simply averse to getting a sweat shower from an opponent whose lunch still smells on his breath. Fortunately, other options exist that fall well short of competing in the Ultimate Fighting Championship yet provide the health and fitness benefits of this type of training. Some top MMA centers now offer classes for the general public in which the only contact involves repeatedly hitting a heavy bag with punches, kicks and knees, mixed with other drills like push-ups and sit-ups. Marcia and Egan Inoue demonstrate a move for Corrie Leandro, in black, and Sarita Williams at Grappling Unlimited in Manoa Marketplace. "I've gained amazing strength, attitude -- there's a warrior inside of me that's come out," said 60-year-old Dirk von Guenthner, who has been attending a circuit-training class at the Icon Sport MMA and fitness facility at Niu Valley Center for more than two months. "This gym brings out every ounce of energy and power that I have, and it's really converted me from not having a place to be to having a place where I belong. The class I attend, we fight the bag, and we don't have to get punched." Though it doesn't involve person-to-person contact, the curriculum for Guenthner's class -- which runs less than an hour -- was derived from UFC star Chris Leben's training regimen. Leben is lead instructor at Icon Sport. Sparring might be included at Icon Sport and other similar facilities for beginners of virtually all ages and both genders. "All of our classes -- other than our pro fight-team practice -- are taught at a level that a beginner can take, and it doesn't take away from the experts because you can never have enough foundation," said T. Jay Thompson, Icon's owner and also one of its instructors. "I tell all our members that the only job they have is to -- two, three, four, five days a week -- walk through that door." Nolan Hong worked a good sweat at Icon Sport. Sharon Murakami never anticipated becoming a mixed martial arts addict. Yet, once she started training as a way to encourage her son to also practice self-defense, she couldn't stop. » The Studio: Manoa Marketplace, 2754 Woodlawn Drive, 988-6200, www.TheStudioHawaii.com. Memberships $90 to $150 per month. » Grappling Unlimited: Manoa Marketplace, 2851 E. Manoa Road, 988-6200, www.GUHawaii.com. Memberships $90 to $125 per month. Dual memberships to The Studio and Grappling Unlimited are $150 to $180 monthly. » Icon Sport: Niu Valley Center, 5722 Kalanianaole Highway, 373-4266, www.myspace.com/iconmma. Memberships $50 per month to $150 for unlimited VIP membership. While Murakami stays away from full-contact drills, she is a regular at The Studio in the Manoa Marketplace, which is run by former professional MMA fighter Egan Inoue. She began 15 months ago, and well before the first year was up she went from a size 12 dress to a 6 and earned toned muscles and more energy to boot. "I thought I'd go with him, just for support. In fact the whole family came down, and next thing you know we all joined and we're all hooked," Murakami said. "This is nothing like (the physical activities) I've done before; you get a really good workout and you're learning something at the same time. I take all the classes except for jiu-jitsu -- because I have personal-space concerns -- and I'm here basically every day of the week." Some folks still believe MMA -- a combination of fighting forms that includes striking, grappling and submission moves -- to be pure blood sport and the domain of brainless dudes looking for an excuse to fight. But many others, like Murakami and her family, have come to realize that MMA is the most practically applicable form of self-defense because of its crossbred nature, and that it can be a great workout that needn't involve sparring, much less mortal combat. Jacob Haught dropped to floor then popped back up to pummel the heavy bag during a workout at Icon Sport. MMA gyms -- found in or near every town on Oahu and fairly easily on most neighbor islands as well -- typically offer a range of classes for the general public in addition to training for true fighters. For those inclined only to give and not receive punishment, there are heavy bags that can take as much as you can mete out without striking back. "I always wanted a workout place for people from young to as old as around 70, and from all of my training I've realized that MMA workouts are the best workouts," Inoue said. "It entails everything. You work your cardio, your aerobic, your anaerobic, fast-twitch and slow-twitch muscles and balance." Inoue was a world champion in both Brazilian jiu-jitsu and, amazingly enough, racquetball. His last MMA bout was four years ago, and he opened The Studio just over a year ago, specifically to provide a place for people who wanted MMA-type training without full contact. 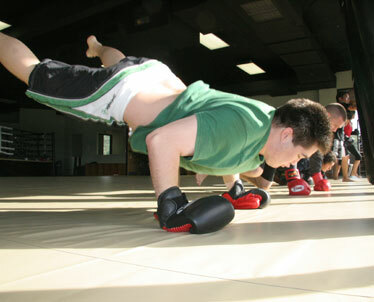 Classes typically last 45 minutes and range from those just for keiki or seniors, to boxing and kickboxing workouts that include men and nearly as many women. Draten Morisato, left, and his twin brother, Chaden practiced their moves at Grappling Unlimited. On the opposite end of the shopping center is Inoue's Grappling Unlimited studio for those who prefer tangling with an opponent. More than a few of his members train at both facilities. "Women actually progress a lot faster than men because they don't have that macho thing where they try to hit hard," Inoue explained. "Women have a lot of aggression and they like to hit, but because they're not like men wanting to hit harder than the next guy, their technique gets good quick. "My goal is that, in six months, people are going to learn a good jab, a good cross and a good hook; they're going to learn the combinations, the bob-and-weave and get a great workout. This is my fight training brought back for regular people." Inoue offers a first class free, as does T. Jay Thompson, who operates Icon Sport MMA and fitness facility in the Niu Valley Center. Icon Sport is a 9,000 square-foot facility that includes a boxing ring, weight room, pool and spa in addition to a large mat area and, of course, heavy bags. Among its most popular non-contact classes is a circuit-training session weekday mornings that primarily involves four five-minute "rounds" in which participants alternate between 20 seconds of hard activity and 20 seconds of active rest. During the rest time, participants continue executing strikes and the like at a slower rate, to simulate how one can't rest completely during a real round of fighting. "In this gym we have (Ultimate Fighting Championship) fighters, we have senior citizens, we have mothers and kids -- we run the gamut," Thompson said. "Yes, we have tough guys here, but we instill the message that it's OK not to fight outside of the gym, it's OK to treat women good and it's OK to live life in an honorable way. And the overall goal we have for everyone here is long-term health."